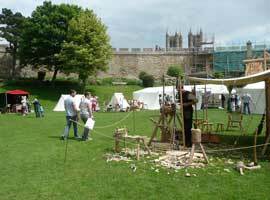 Now in it's fourth year, the 1000 Years of Traditional Crafts event held at Lincoln Castle over the weekend of 31st May and 1st June 2014 has become a popular attraction. Crafts being demonstrated throughout the grounds of the Castle included more than fifty different traditional skills such as blacksmithing, stonemasonry, silversmithing, pole lathe turning and willow weaving. 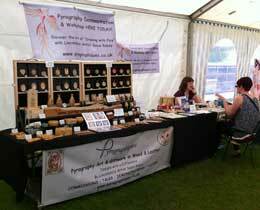 Visitors were able to stroll around and experience a wide variety of crafts and have a go activities. There was also the opportunity to participate in taster sessions of the short courses on offer at the grass roofed Heritage Skills Centre. Susan demonstrated and offered a workshop experience in pyrography while alongside her fellow local artist, Toni Watts, could be seen demonstrating gilding techniques. Best known both locally and internationally for her beautiful wildlife art in acrylic, watercolour and other mediums, Toni has recently become accomplished in the traditional art of medieval illuminated manuscripts. Her course in this subject can be found in the current programme of those on offer at the Heritage Skills Centre. Lincoln Castle was built in 1068 and is regarded as one of the country's best examples of a Norman castle. It is situated just a short distance away from the city's impressive cathedral. This year visitors were given the unique opportunity to go on a behind the scenes tour of the £22 million Lincoln Castle Revealed renovations. The aim of the project is to transform the stone building to a world class visitor attraction for 2015. For the first time in history visitors will be able to walk the complete circuit of the castle walls once the restoration is complete. The Victorian prison is also to be fully restored and there will be a new shop and cafe. Tours over the two days of the conservation work completed so far included a look at the new underground vault which will house Lincoln's original copy of the Magna Carta. As one of only four such documents remaining, it is set to be the star attraction of the whole project. The unveiling of the restored Lincoln Castle in 2015 is scheduled to coincide with the 800th anniversary of the sealing of the Magna Carta. For more information on Lincoln Castle and events being held there in the future, please visit www.lincolncastle.com .